Hay barns are designed to store hay after it is cut from the fields during the spring and summer. Stored hay is expected to last through the fall and winter, providing healthy forage for your animals during the months when fresh grasses are not growing well in your pastures. Your hay is only as good as the barn you store it in. Even the best-quality hay will go bad if it is exposed to moisture or left out in elements. When stored hay becomes wet, mold is inevitable. In some cases, when hay is baled wet or when it was truly too green for cutting, hay can even spontaneously combust in storage. Proper storage of hay is essential for keeping hay in good condition and minimizing problems. 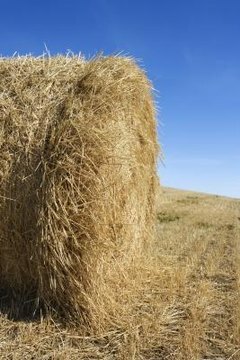 Your hay is going to be in close contact with the floor of your hay barn, so it is important to make sure the floor does not damage the hay. Regardless of the type of floor you install in your hay barn, your focus needs to be on providing a dry space with good drainage and plenty of ventilation. You do not want your hay absorbing moisture from the ground -- so the ideal hay barn will have a raised floor that gets good ventilation from underneath of it. A concrete floor is ideal for a hay barn because it keeps everything level, dry and relatively clean. The downside of concrete is that it can be quite pricey, especially if you have a large hay barn. Gravel is also an option because it provides good drainage and allows for good ventilation. A raised wooden floor is a standard option that has worked well for decades and continues to do a sufficient job keeping hay fresh, so long as the barn is maintained. A dirt floor is not a good choice for a hay barn because the hay will absorb moisture from the ground, leading to mold. If you have a dirt floor or your floor does not get good ventilation or drainage, you will need to do some basic modifications to keep your hay good. Placing wooden or plastic pallets on the floor and then stacking the hay on top of the pallets will provide ground clearance and ventilation for the hay. You can also build a raised platform out of wood for your hay to sit on.